Many new yogis are in awe of the beautiful arm balances they see more advanced students practicing in their classes or on social media. 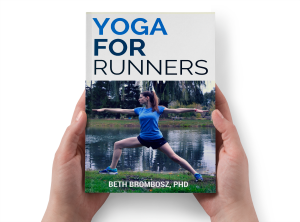 But, building strength for arm balances can take some time. I know I practiced for at least a year before I had the strength to hold basic arm balances for a few breaths. 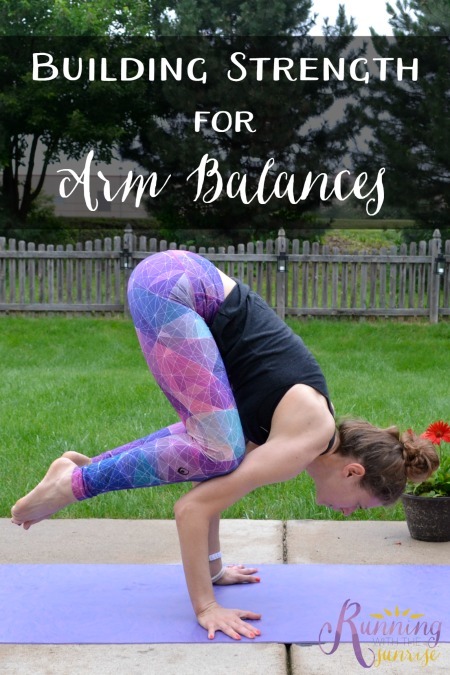 I’m definitely not an arm balance expert, but I wanted to share the yoga poses that have helped me build the strength to get me where I’m currently at on my yoga journey. Disclaimer: I am a yoga teacher, but I’m not your yoga teacher. Always practice yoga mindfully, listen to your body, and if you have any questions, consult with your teacher. I see down dog as the first step toward building arm strength. 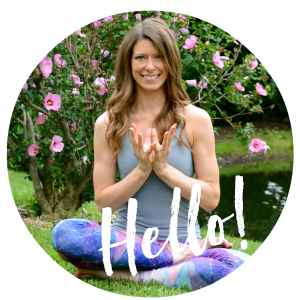 In vinyasa classes (the style I teach and spend a lot of time practicing) you come back to this pose again and again, and I remember struggling to hold down dog when I first started practicing yoga, so it’s a great one to start to build strength in. Ah, the infamous Chaturanga Dandasana. This one took me a while to work up to as well. 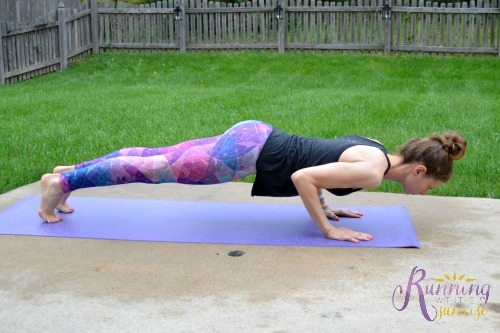 Having great strength in Chaturanga is so important for many arm balances because so many of them use the same arm position as you do in chaturanga. Be sure you’re keeping your elbows and upper arms glued to your ribcage to protect your shoulders! 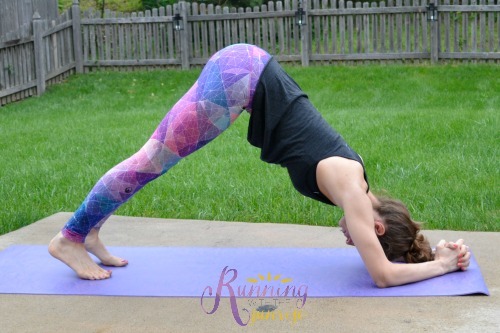 Want to build strength for #yoga arm balances? Try these poses! Makarasana is a wonderful pose to build strength in the arms, shoulders, and really the entire upper body. Really work on engaging the muscles along the side of your ribcage to build strength for poses that balance on the forearms. Start by holding the pose for as long as you can, even a few breaths, and work on building strength to hold the pose for longer periods of time. You work your core a lot in arm balances, so having a strong core is just as important as having strength in the arms and shoulders. Core strengthening poses like plank, side plank, and boat will help you build your core so you can help hold your body in your arm balances. So, be sure you’re giving your core some love, too! Love my tank and leggings? They’re from Inner Fire Apparel. I’m an ambassador for Inner Fire which means you, my darling readers, get to save money on their clothing. Use coupon code bethb for 15% off any Inner Fire purchase! Yogis: where are you at on your yoga journey? Are there any poses you’re working toward? You are too cute! Arm balances are at the very top of my yoga love list of favorites. I hope to get back to more practice as soon as the NASM exam is done. Have an awesome Thursday Beth! Blogfest is so so close! Woohoo! I am so impressed by your strength! No matter how strong I think my arms are or how much I can lift, I still cannot for the life of me pull something like this off! ok i need to work on these because my arms are definitely my weakest part of my body! Those pants, those arms, that awesomeness 😀 I miss being stronger, but I’ve not been as consistent in my practice this time around, and my strength has really suffered, regardless of the gym work that I’ve done. I miss my gorgeous arms! Yoga is such a great arm workout, I really need to start doing it more regularly, especially as I’m trying to build arm and back strength to improve my running form. Your outfit is too adorable. Love the bright pants! I have discovered through Orange Theory that my weakest areas are my core strength and balance. People always ask me about my arms…I give all my credit to yoga! You’ve hit all the high points here! Great tips! I’m starting to do yoga in a studio and at the end of each flow class they challenge us to try a tougher pose. Crow pose is offered a lot, and I always feel a little jealous because I can’t do it at all. I definitely want to work on my arm strength and be able to get there some day! But I love that you mentioned that it’s okay if I don’t ever get there. Um YES I love your leggings!! I’m working on not using the wall for a forearm supported head stand. I can get my legs up using my core, but the waver too much and I get scared! You look fabulous in all of these poses. I don’t think Susie emphasized your badassery enough, but you look so strong!! Props to you for all the hard work. Hi! My name is Amber and I have recently had knee surgery. I want to start yoga as soon as possible but it has been a little difficult to get exercises in. Are there any poses or sequences that you might recommend that I could use to strengthen my knee, or that would be compatible with limited range of motion in the knee? Thanks so much! For balance, strength in arms and core is really important. These are really good exercises for building arm & core strength, which further makes you able to do balancing.